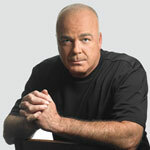 Bret muses on possible ways that he might be able to get in touch with his inner Vorlon and explore all the depths of those deeply buried feelings (despite previous warnings about permeating bodily odors). 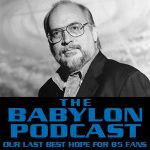 Share the B5 Love: If you have any friends who enjoyed watching Babylon 5, don’t assume they already know about this podcast… Tell them, and ask them to tell their friends who are B5 fans. Spread the word about the fun we’re having here! 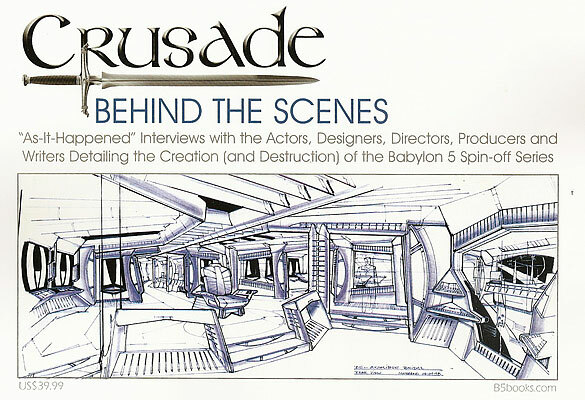 Interview: The Jason Davis, Senior Editor at Synthetic Worlds Publishing, chats with Tim, Summer, and Bret about Crusade: Behind the Scenes, which is available for purchase right now at Babylon 5 Books. Jason talks to us about all the things he learned while compiling these interviews, and that this book came about to not only release some never-before-seen interviews, but to also assuage the yearnings of eager B5 fans who are craving the Crusade script books. He also gives us a tease about what to expect from the upcoming Crusade script books, Crusade: What the Hell Happened?, and promises that those are coming “soon”. Feedback: Al sends in an email asking what episode order we’ll be using to cover Crusade, and ya know, we haven’t decided that yet! The TNT broadcast order is the order of the US DVD set, and the various episode orders can be found on the Crusade Wikipedia page. 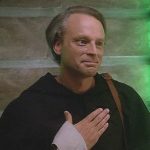 Mike Tuck wonders how much certain elements from The Last Starfighter might have inspired or influenced JMS while he was creating the Babylon 5 universe… and we learn that Tim has never watched The Last Starfighter, so we really need to sit him down with a DVD and make him watch it! Tom wants to know if anyof the Babylon Podcast crew will be attending any conventions anytime soon, and honestly, other than Phoenix Comicon at the end of May, it’s very unlikely; Uwe from Germany has just found the podcast and thanks us for all of the work we’ve done so far while he’s catching up on the shows. I got my copy last night….I can’t wait to dive in now! I’m about 1/3 of the way into the book, thanks to a snowy day here in the Northeast…very interesting read. And a bit painful, too…all that potential wasted. It’s hard to read the interviews of cast and crew excited to have what they thought would be a long-term gig…. I was thinking the same thing John. You almost feel like a time traveller. You listen to what they actors and crew are saying and it’s so optimistic, but you know the train wreck is right around the corner. You walk away with quite a different experience than the B5 end which was truly a wrap up. I look forward to the Crusade script books which is supposed to include the series outline. Finished the book (thanks to a second day home due to snow). Wow. There is so much insight into how little information the cast and crew had been given, both in terms of the direction the show was going to take and the truth behind the ridiculousness of TNT and WB. There are lots of little hints and revelations about the extent of TNT’s interference and game-playing, and it’s really quite eye-opening. “Crusade” never had a prayer. One thing that really bothered me was Janet Greek’s post-series ranting over Gary Cole. We all know what JMS’ plans for Gideon were by now, and more information will be coming, but Greek really takes her limited perspective and runs with it. making a lot of unwarranted (and completely wrong) assumptions. It’s some of the most cringe-worthy material in the book, hands-down. The interesting thing to me about the whole Gary Cole business is that in the interviews with Dobro and Brooks, they talked about how well the cast bonded, but in each case they name “Daniel, Marjean, and Peter” as the others. No mention of Gary Cole.